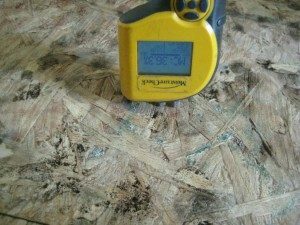 It is possible for medium density fiber (MDF) board to promote mold growth anywhere in your home including your sub-floor. With enough water and time the semi porous fibers and glue begin to expand and allow mold to grow on and in the MDF board. If recognized during a mold inspection, a certified mold inspector may recommend that the building materials have to be removed and replaced. In this case, the mold inspector may have recognized that the overall integrity, moisture level, and composition of the materials have been compromised. It may seem odd and peculiar but mold growth may be in between the layers of wood. Water damage causes the materials to expand and create gaps. This space in between the material promotes the growth of mold. It soon becomes a dark and moist area for mold to thrive. Items currently made of MDF board in your home may include your baseboards, bathroom cabinet, dressers, kitchen cabinets, crown moldings, window moldings, exterior plywood, and even the sub-floor.